It’s time for another super-scrumptious salad recipe! 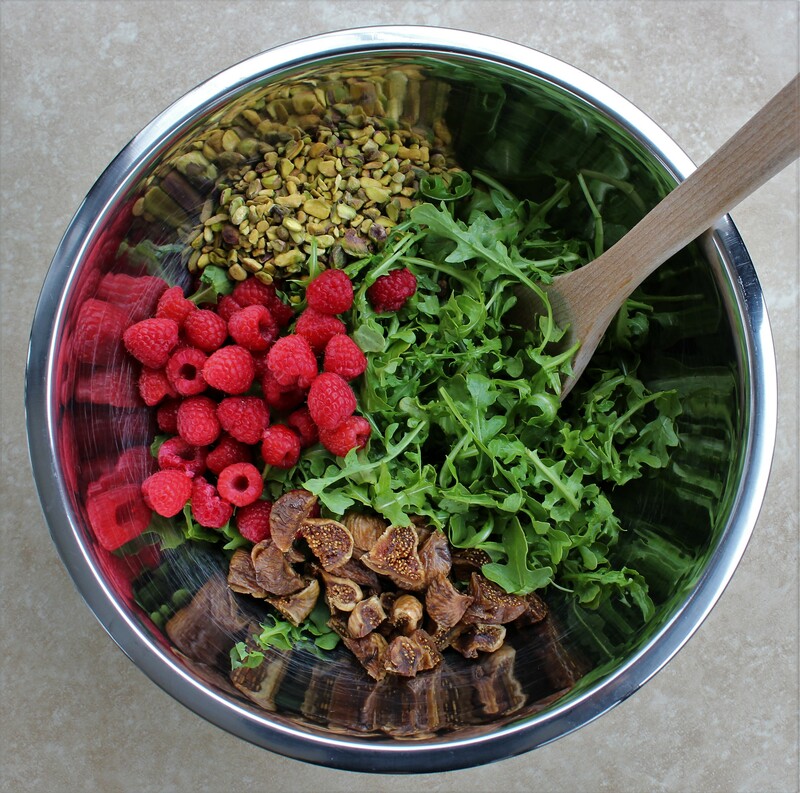 Say hello to Arugula Salad with Raspberries, Figs, and Pistachios! This salad was born out of my desire to have an excuse to eat more arugula, because I love its delicate leaves and peppery flavor very, very much and would probably make every other post on this blog an arugula-salad post if not for variety’s sake. Speaking of variety: I’m usually a big fan of it. Yes, I have staple foods in my life that I turn to time and again (apple-slices-with-peanut-butter – that savior snack! – has become a regular midmorning fix at my corporate day job), but it probably won’t surprise you to learn that I enjoy trying new dishes rather than eating the same ol’, same ol’. Still, I’ve decided that this Arugula Salad with Raspberries, Figs, and Pistachios is worth the re-eat – and the re-eat and the re-eat – it’s THAT delicious to me. It’s a wholly vegan, wholly gluten-free, whole-foods-based revelation! It is poised to shape me into a Same-Lunch convert – and I kind of like it! 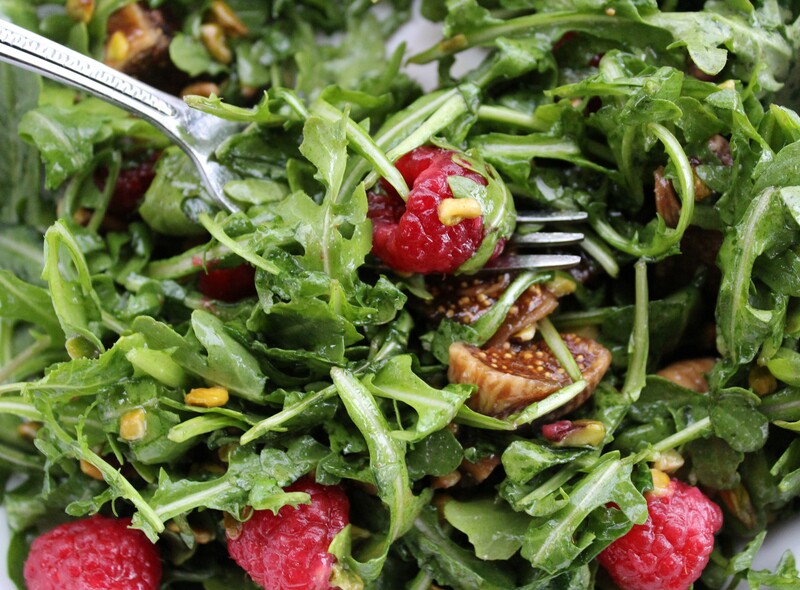 Why is this Arugula Salad with Raspberries, Figs, and Pistachios so delectable? Because not only have we got lovely arugula forming the base of this salad, we have raspberries, that fairest member of the berry family! I am loving their delicately sweet, delicately tart flavor in this salad. And pistachios! Pistachios have been on my mind lately; they are screaming “SPRING!” to me. Maybe their chartreuse hue is reminding me of the tender green blades of grass and flower stems starting to push up through the earth in my neck of the woods. At any rate, pistachios complement the raspberries well, as they do our other featured ingredient: figs. Crazily enough, while working on preparing this recipe it was my first time in my recollection that I’d ever eaten a fig, which is kind of wild. I ate a crap-load of Fig Newtons in my youth – does that count? Obviously, not really. The sundried figs that I use in this recipe are essentially the natural Fig Newton; I am loving their rich, chewy flavor! And to top off this Arugula Salad with Raspberries, Figs, and Pistachios, the lemon vinaigrette dressing is a classic! I mean, can you EVER go wrong with lemon vinaigrette? It’s light and zesty and adds loads of flavor without being overpowering. Regarding the dressing: the recipe below yields more than you’ll need for this salad. I like making larger quantities of dressing so I have some left for additional uses. Any leftover dressing will keep well in a covered container in the fridge for about a week. Also worth noting: I used sundried figs because my local fruit market didn’t have any fresh figs currently in stock. If you can get your hands on some fresh figs and would like to use them instead, please feel free! You will likely want to use fewer of them – say, four as opposed to the nine dried ones I’ve dictated – since they are bigger fresh than dried. OK, on to the recipe! 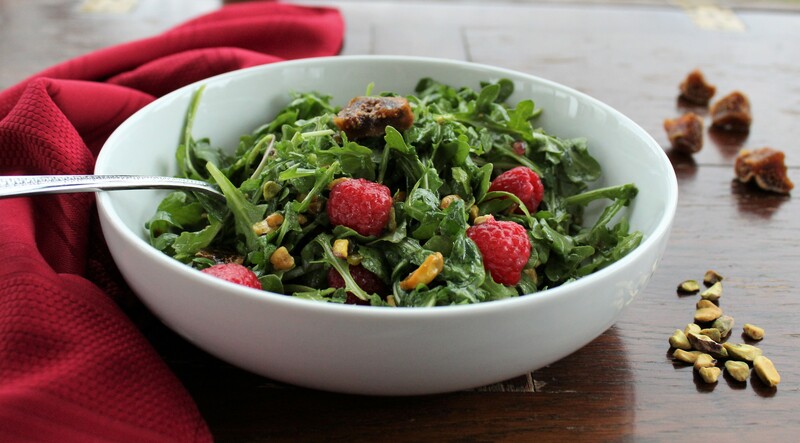 In a large bowl, combine the arugula, figs, raspberries, and pistachios. To a mason jar or similar such container with a lid, add the dressing ingredients and shake well. Pour the desired amount of dressing over the salad and toss to evenly coat it. And you’re done – you have a vibrantly-flavored salad to enjoy! Makes 2-3 servings.